There's a lot I like about BioWare's MMO shooter Anthem, but then there are also a lot of things I don't like about it. Most of the latter seem to be things that can be fixed, and I have to wonder if they would have been fixed before anyone played the game had it spent another six months or so in development. I'll start with what I like about the game, but first let's look at the world of Anthem. Anthem takes place on a world that was being forged by god-like beings known as the Shapers. The Shapers used a power known as the Anthem of Creation to create worlds and populate them with all manner of creatures and monsters, but they never quite finished with this world before they mysteriously vanished ages ago. Shaper ruins and artifacts cover the world, some lying dormant waiting to be awoken and harnessed, others active and uncontrolled, unleashing massive titans out into the world. Humans exist in this world behind great walled cities, relying on huge armored walkers to transport goods across the dangerous wilderness that lies between these bastions of civilization. Dealing with those dangers directly falls upon the shoulders of the Freelancers, mercenaries who pilot armored suits bristling with weapons known as Javelins, and that's your role in the game. There are four types of Javelins in the game, each with its own unique qualities. You'll start out with just one Javelin, but as you level up you'll eventually unlock access to all four. 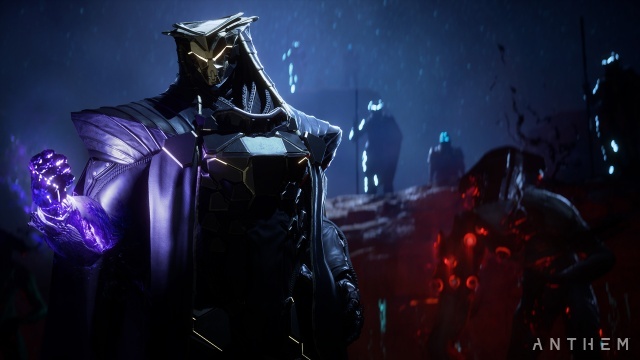 Unfortunately, Anthem commits that classic MMO sin of making you commit to a class before you know anything about them, so you'll just have to pick the one that you think you'll like the most and hope for the best. You'll have some gameplay under your belt before you make your next selection, so by paying attention how players with other Javelin types play the game you'll be able to make a more informed decision by the time you unlock your second Javelin. The most balanced Javelin is the Ranger, which you can think of as the assault soldier class of the suits. It's balanced between armor and mobility, and mounts weapons such as missiles and grenades that will be familiar to shooter players and well within their comfort zones. The tank class in Anthem is the Colossus Javelin, lumbering but heavily armored. Its weapon systems are geared towards slugging it out with enemies from close range and include flamethrowers and short-range artillery. The Storm is the ranged class, harnessing elemental powers to call down flame and lightning strikes on groups of enemies while hovering above the battlefield. Finally, we have the Interceptor, a lightly armored but extremely fast and mobile Javelin designed to deliver devastating melee attacks and then dodge out of harm's way when its target tries to return the attack. All classes also wield firearms, which fall into standard weapon classes such as assault rifles, sniper rifles, shotguns, and side arms. Each Javelin has the ability to fly, both by soaring through the skies at high speed and by hovering over the heads of enemies in battle. 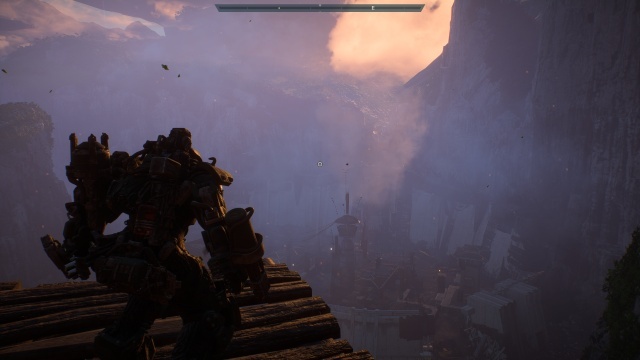 Flight in Anthem is liberating, it feels incredible to fly across wide valleys and deep canyons, over plunging waterfalls, or past ancient towers. Combat becomes three-dimensional, opening up your tactical options to flank opponents and find new sightlines. 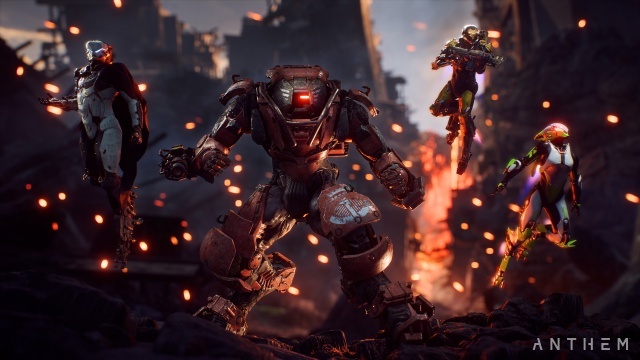 Anthem will make you feel like Iron Man more than any Iron Man game ever has, especially when you use a Storm to fire bolts of energy at enemies while flying circles around their heads or pound enemies in the Hulk-buster like Colossus. I played all of the Javelin classes, and they're each enjoyable to play in their own way. The Colossus can make a grand entrance into a battle, flying over the battlefield and then dropping into the middle of a group of enemies while launching a melee attack right on landing that sends enemies flying. The Storm makes you feel like a super hero, as its extended hover time allows you to rain down elemental attacks from above as you circle the battle. The Interceptor is so fast and mobile that you'll feel like a ninja as you dart and somersault through enemy lines cutting foes down in seconds with your deadly blades. Even the workhorse Ranger has its pleasures as it's always fun to back up your weapons fire with missile salvos like a mini mech warrior. Squads of players can work in tandem to use their Javelin abilities to not only defeat enemies more quickly, but also to create a myriad of different combo attacks. Combat is enjoyable and satisfying, leaving you a lot of room to experiment with different weapons and tactics while avoiding the falling into the kind of rut you often quickly find yourself in in a lot of MMO games. When you're not out in the field, you'll be spending your time in the game's hub location, Fort Tarsis. This is where you'll interact with most of the story's primary characters, as well as meet side characters with their own narratives. It's also home to the Forge, which allows you to access the screens on which you can set your Javelin loadouts and customize your suits' looks. 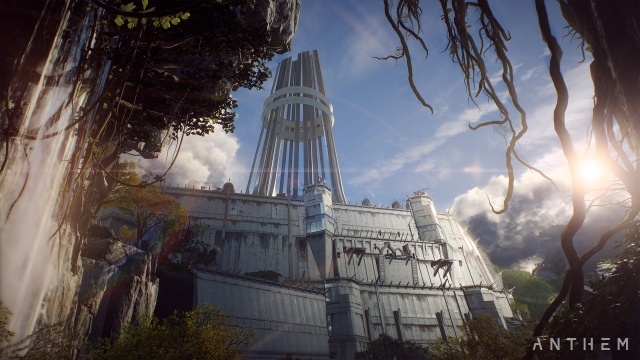 Fort Tarsis will evolve as you make your way through the storyline - you'll return from missions to find new characters and conservation options available, new vendors, or even that parts of the fort have been spruced up. Since all of this is driven off of your exploits and conversation choices, you'll have your own personal Fort Tarsis. The multiplayer social space is confined to a large garage like room separated from the fort itself which is a little odd, but if you want to show off your Javelin or check out those of other players outside of the wilds it's your only choice. The conversations that you'll have with the NPCs are interesting, and they represent a diversity of personality types while avoiding MMO stereotypes. The choices that you make while speaking with them seem to have an effect on your relationship with them and their relationships with other characters, but since you can only have a single character tied to your account I wasn't able to see what would happen if I had made different choices. There's a lot to like about Anthem, but for every single one of those things there seems to be a misstep, poor design decision, or something that's just plain broken. Let's start with flight. For some reason that I can't fathom, the game limits your ability to fly continuously. A lot. As you fly, your suit will begin to heat-up and if you overheat, you'll unceremoniously come crashing down to the ground. There are two ways to cool your suit in flight, flying through water or going into an extended dive. The water method only works if there happens to be a waterfall along your route or you can find a stream to skim. The dive method requires that you have a lot of vertical space and is often entirely unpractical. More often than not, traversing the map will involve periodically dropping to the ground and jogging off the heat before you can take flight again. Why the developers would nerf one of the most enjoyable aspect of the game in this way is beyond me. When you launch a mission, you'll have the option of playing it solo or with a group of players. Playing in a group will give you more experience than you'll earn playing on your own, so there's strong motivation to play as part of a group. If you don't have three friends online at the moment, the game will automatically match you with other players. Unfortunately, you won't always enter the mission at the same time as the other players. You'll need to catch up to the group, which can be an exercise in frustration. First of all, you'll need to deal with your overheating suit which will interrupt your attempt to make up lost ground on more than one occasion. If your team makes it to the first mission location before you, you'll hear the mission audio, which is always a bit weird because you'll hear your character carrying on a conversation with someone who's not there. If you are taking too long to catch up to your group, the game will start a countdown. If the countdown ends before you reach the group, the game will teleport you to them, but this involves getting kicked out to a load screen. If mission audio is playing when this happens, it will be cut-off by the load screen and you'll miss out on it. And it's not just at the beginning of a mission that this can happen. The game rubberbands the group throughout the whole mission. If one person takes off towards the next waypoint, the rest of the group has to get moving or they'll find themselves stuck behind a load screen while the next phase of the mission begins. Or your suit will overheat on you while you're on your way to the next waypoint, leaving you no chance to catch up and kicking you to the load screen. Sometimes this problem is so bad that you'll find yourself at the mission summary screen with no idea what transpired during the mission. Sometimes I just didn't want to deal with the potential of this happening and played some of the missions solo. They were harder and I didn't get as much experience for them as I would have otherwise, but at least I was sure that I could enjoy them with their continuity intact. For a game that emphasizes teamwork this is a major problem and should be a major priority for the team to address. Loading screens are not just a problem when you get separated from your team on a mission. You'll hit load screens on every transition. Enter an interior location. Load screen. Turn around and leave. Load screen. Enter the Forge. Load screen. Leave the Forge, load screen. The load times aren't fast, either, so each load screen takes away from both your time with the game and your sense of immersion. Probably the most surprising thing with Anthem is that a game that is focused on your suits has so few customization options available for them. There are plenty of shaders and textures available, and a full color wheel lets you get all of the colors on your Javelins exactly as you want them, but want to try a new helmet or chest piece? You'll literally have one or two of these to choose between. I'm simply shocked that they did not have an entire art department at work creating custom Javelin parts. It's just as bad with the weapons. There are only a handful of actual types available, with rarer versions having slightly better stats, and the weapon's level number is usually the only way to distinguish one from the other. And since you can only equip weapons in the Forge and you can't access the Forge during a mission, you can't see or equip any weapons or components that you find during a mission until it's over and you're back home. Lastly, I should mention that the game's UI is a mess. Selecting a mission when leaving Fort Tarsis is a clunky process that requires shuffling back and forth between far too many subscreens. Even worse, all status messages you'll see during a mission will appear at the bottom center of the screen and if two messages appear at any time they will be stacked on top of each other. The countdown timer for catching up to your team will obscure your Javelin's heat meter, which is about the worst time to not know how much farther you can push your suit. And if the system informs you that a server restart is scheduled for an hour from now, that message will be put on top of everything else. It's hard to imagine that no one on the development team was aware of this problem. There's a good game at Anthem's core, the combat is enjoyable and flight is enjoyable between suit overheats. I can't help but think that with an additional six months or so of development Anthem would be a great game. Since not all of the end game features were shipped with the game and are instead on the development roadmap for the next few months, it's unlikely that some of the basic game issues will be addressed in the near term. If you want a full game, wait a while for them to work all of these problems out and jump into the game then. Otherwise, you can have fun with Anthem, but you better have a lot of patience. Final Rating: 65% - A game with a lot of potential that was released before it was ready.